A few months ago, we introduced Google Latitude, a new feature for mobile and iGoogle that lets you share your location with your friends. Since the launch, a lot of you have asked "What if I want to share my location with people who are not my Latitude friends?" Today, we're happy to release two applications that make that possible. Google Talk location status (beta) automatically updates your Google Talk or Gmail chat status message with your Latitude location. With this application enabled, all of your chat buddies can see your most recent city-level location. 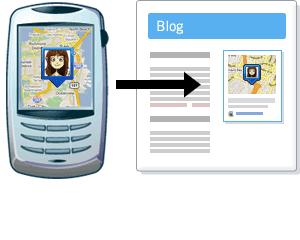 The Google Public Location Badge lets you publish your Latitude location on your blog or website. You can choose to show just the city that you are in or you can have your device's location detected automatically, using GPS, Wi-Fi, or cell tower ID, which provides a more specific location. To read more about these new features, visit the Google Mobile Blog. If you're already a Latitude user, give the new apps a try. If you don't have a Google Latitude account, sign up and start sharing your location now. We take your privacy very seriously and you can read the privacy notice on the application pages for more information. In the near future, we hope to offer a way to share your location in even more applications. If you have any suggestions or comments, please visit our Product Ideas page.